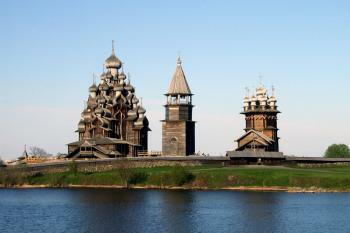 The Kizhi Pogost is an enclosure that holds two 18th-century wooden churches and an octagonal bell tower. Kizhi is located on a narrow strip of land on the southern tip of the island of Kizhi on Lake Onega in Karelia. The jewel of its architecture is the 22-domed Transfiguration Church (1714), with a large iconostasis—a wooden screen covered with religious portraits, featuring much gold leaf. This massive church (also known as the "summer church") is about 30m tall, making it one of the tallest log structures in the world. The smaller, nine-domed Intercession Church (also known as the "winter church") was built in 1764, and its iconostasis is intact and can be seen by visitors. The third structure inside the Pogost is the belltower which was built in 1874. The belltower is also constructed with walls of horizontally-fitted logs, though they are covered by exterior wooden planks and cannot be seen. These structures were erected without any nails or other metal, and were made of scribe-fitted horizontal logs, with interlocking corner joinery—either round notch or dovetail—cut by axes. Petrozavodsk seems to be a good base for visiting at least two WHS and one TWHS. There are one-day trips to TWHS Valaam Archipelago and even Solovetsky Islands (full trip takes 28 hours only, which is most probably the easiest way to visit these remote monasteries). And of course it is the best (the only?) starting point to visit one of Northern Russia’s highlights – Kizhi Pogost. There are several speed boats shuttling between Petrozavodsk and Kizhi, but during summer almost all of them are fully booked – if you are coming in a bigger group, booking in advance is a must. The whole trip takes around 7 hours (3h on boat and 4h on the island) and costs around RUB 3300 (including entry ticket – prices for July 2016). Kizhi Island is famous of its remarkable wooden architecture, including world famous Transfiguration Church with 22 wooden domes. The church is now under renovation and can only be visited from outside, but the the museum’s authorities do what they can to compensate this inconvenience. 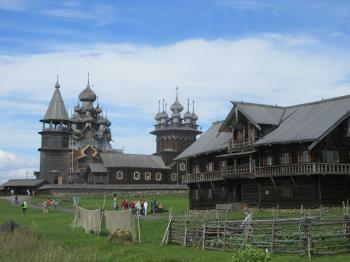 Kizhi Island is one of the best managed tourist spots I have visited in Russia. Although the number of tourists visiting the island is quite high (including a few huge cruise ships on their way from St. Petersburg to Astrakhan), all tours are guided and you do not need to wait too long to see the main attractions. The whole island is a museum of wooden architecture – apart from churches, there are wooden bell towers and numerous houses. Inside churches you may listen to sacral choirs, while houses are full of craftsmen presenting traditional activities of rural Russia in XIX-th century. Tourists are discouraged from stepping off beaten paths – this is because of a quite high number of vipers living on the island. I was very lucky with the weather, which allowed me to make some nice photographs of Kizhi – a place that is known of its picturesque views. Although Petrozavodsk is a bit far from well-known Russian tourist spots, for me going here is worthy for Kizhi itself, not counting other numerous attractions of Karelia. As I arrived on Kizhi at 9 am early in September, there was a chill in the air although the sun was shining, but then it is only a few hundred kilometres from the Arctic Circle. I could hear the tinkling of bells in the distance. Several groups were shown around the site, and after seeing the wonderful trio of the Transfiguration Church, the Intercession church and the Bell Tower I again heard the bells. Next we saw a good representation of a Russian family home - then after a short walk it was our group's turn to be treated to Igor the bell ringer's skills! The wooden architecture on the island was amazing, and never have I been anywhere where the air is so pure, and the blue of the sky and lake against the green grass was so clear. By midday it was very warm, but I cannot imagine how cold it must be in the winter! A truly memorable visit. I was fortunate enough to have visited Kizhi with Russian friends, with whom I had been travelling. They paid all fees, so I do not know the price of the hydrofoil from Petrozavodsk, nor the entry fee. Khizi is awesome! Aside from the beautiful setting, the churches, bell tower, and other wooden structures blend wonderfully with their surroundings. I was so impressed by the craftsmanship of the structures and by their size. We had a beautiful day for our visit, and thoroughly enjoyed a picinic lunch near an old, abandoned wood dock. Wildflowers abound on the island, further enhancing it's beauty. Khizi is a must-see for any visitor to Russia. The Wooden Churches of Khizi, with their glistening silvery aspen shingles and their setting (if you are lucky with the weather!) among green fields next to blue waters, provide one of the WHS list’s great “iconic” views (photo). Many WHS are just “representative” rather than being “uniquely outstanding” but Kizhi’s striking shapes, magnificent craftsmanship and wonderful location lift them way out “of the ordinary” from among the many Christian buildings on the List – they did not disappoint and fully met my criteria for “Worth a journey”! The WHS consists of the “Pogost” or walled enclosure and gate containing the Summer Church of the Transfiguration (left), the Winter Church of the Intercession (right) and a bell tower. The small island of Kizhi (6 x 1.5 kms) on which they are situated lies at the northern end of Lake Onega (said to be the second largest lake in Europe). 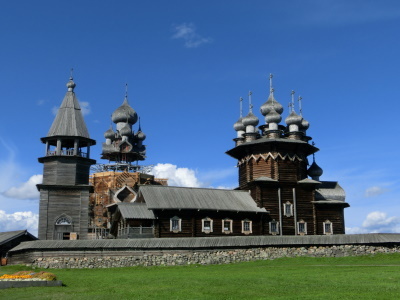 The island itself constitutes an “Open Air Museum” with a range of wooden buildings re-erected from elsewhere in the region (including 2 more churches, one of which is from the 14th century and is claimed to be the oldest wooden building in Russia). We were somewhat concerned that this would detract from the impact of the inscribed “original” churches (which date back to the 18th century). The UNESCO inscription was also worried about this aspect. In fact, for a number of reasons, we felt that the extension of the site beyond its historical scope was a successful use of the space available on the island, even though the relocated buildings at the southern end of the island could be seen from the Pogost. First, whatever method of transport you use, it is quite a journey to get to the island and the Pogost by itself, wonderful as it is, can usefully be augmented by other sights. The buildings and their vernacular contents are of interest (if a bit too "perfect"! )and there are also the usual “peasants” in costume doing peasant-like things a la Skansen! Second, the site receives a LOT of tourists. Leaving aside the independent and local travellers who arrive on the 75min hydrofoil journey from Petrozavodsk (there is no tourist accommodation on the island), perhaps 5-10 cruise ships per day disgorge around 250 tourists each in a short space of time during the summer season as part of a tour of the “Golden Ring” between Moscow and St Petersburg. The open air museum buildings are conveniently “duplicated” – ie 2 (different) farmhouses, 2 (different) churches etc. Each guided group only visits one each and this diverts and splits up the numbers visiting the Pogost. They are also reasonably spaced apart and not too close to the Pogost. So, in general, we felt that the crowd management worked well. Unusually for us we too were “guilty” of arriving on a cruise ship (travelling from Astrakhan to St Petersburg in our case) and had 5 hours on the island. After taking part in the guided trip we had plenty of opportunity to schedule return visits to most of the buildings between group arrivals and thus achieve reasonable “solitude” both inside and out. Our trip was “inclusive” but I understand that entry to the island (for foreigners at least) is around 15 euros. Kizhi Museum Web site. The documentation about the restoration process on that site describes what has been done and the many continuing technical and financial problems. At one time UNESCO even considered adding this building to the list of Sites in Danger. Whether the new wooden ramp and gateway (just visible at bottom left in my photo using Internet Explorer 7.0 zoom!) indicate any imminent reopening for the public during the project or are to provide improved access for equipment and materials needed to carry out the restoration I know not. The Church of the Intercession is open. It is much smaller and simpler than the “summer” church which provided for more people travelling from long distances. It contains a number of Icons and an altar. It was nice to get inside and contrast its more simple expressions of faith with the exuberance of the exterior but the real glory of the site is to be found in the external views. The shape of the buildings and the open water/countryside location, together with the changes in sun and sky, provide new interest at every step and turn. You will need a lot of space on your digital card!. Been part of independent Finland (de facto): Finnish army occupied the area of Petrozavodsk and Olonets Karelia in 1941, including the peninsula and island of Kizhi. The area was held by Finnish forces until 1944. The area of Kizhi was front line and the furthest place Finnish army advanced during the Continuation War. There is even a legend that Finnish bombers didn't want to drop bombs to Kizhi Pogost.